Johnny versus JARVIS in a battle to the terabyte. Johnny Depp is artificial intelligence scientist Will Caster, who is on the verge of creating the ultimate A.I. computer, when he is gunned down by an anti-tech extremist. Before Will dies, his wife Evelyn (Rebecca Hall) and their scientist best friend Max (Paul Bettany aka Iron Man’s Computer J.A.R.V.I.S.) transfer Will’s brain patterns into his supercomputer. And all Jack Sparrow breaks loose. Transferring human consciousness to a computer has become such a regular occurrence in modern movies it can be explained in ONE LINE of dialogue, using the Gozinta Formulation: Brain waves are electrical. Computers are electrical. Kablooey! Man gozinta Machine! Unfortunately, like all new technology, this plot device is still infused with fear, rather than promise or wonder. Computer Will is eventually painted as the bad guy regarded as ominous and illegal. During a speech, Will speaks of his aim to merge every intelligence on the planet, calling the Artificial Intelligence process “transcendence.” The only crime is the religious overtone, otherwise, instead of becoming the same tired thriller of a man merging with his computer and becoming a wanton killer for no reason, TRANSCENDENCE takes us in more cerebral, intriguing and realistic directions. Credit to writer Jack Paglen and director Wally Pfister (cinematographer on THE DARK KNIGHT trilogy) for not rehashing a 1960’s B-movie. Ironically, their bland execution of Depp’s Deep Thought tells us they didn’t think it through enough. Firstly, there are cognitive dissonances in the plot. For example, Evelyn buys a small desert town and builds an expansive underground facility to house Will’s big brain. Understood: they’re hiding from the government; but above ground, they build thousands of solar panels. One would think the land deal alone would set off government klaxons, if not the overt acreage of solar panels, but we cut to the government spooks: “We can’t find him!” Yeah, that’s some kinda drone program you idiots have. While Depp mumbles like he’s trying to sound like Madonna trying to sound British, his friend Max is slowly turned by the government and the anti-tech extremists, called RIFT (Revolutionary Independence From Technology). Kate Mara leads RIFT, but does nothing except dye her hair the color of Startling Office Paper and makes some illogical threat gesture at the end against Max. 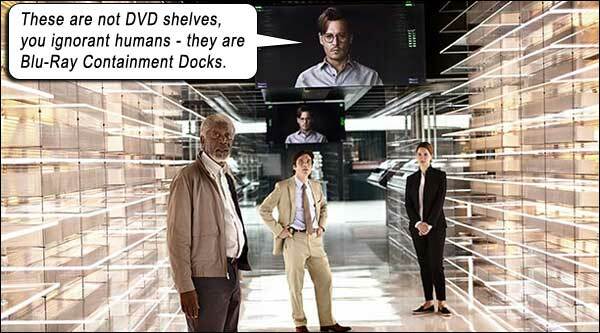 Morgan Freeman is a tech who allies with Cillian Murphy’s government spooks, portrayed as “good guys” – but they’re THE GOVERNMENT. And – like the hubristic American government that stultifies other countries creating nukes while they themselves stockpile hundreds – these two pricks simply don’t want Will Caster to have what they already possess – mind control over the population. A worker at the facility (Clifton Collins Jr.) is injured and undergoes radical computerized surgery at Will’s underground lab, which not only restores him to perfect health, but super strength, and implanted with a chip that allows Will to transfer his consciousness into this person at will. The question of what makes you YOU is no more a case of Nature or Nurture – but Download. Unlike most computer-oriented stories where the computer deduces that mankind is a danger to itself and must therefore be eradicated, Will implants his A.I. into numerous humans via a chip (sound familiar? Debit card chips? Chips in your dog’s collar? Chips under the skin of kids?…) and amasses a “hive mind,” an army of people ready to do his bidding. For the environment. For the children. It’s not as science fiction as it sounds. Consider any political rally, on any side, from any country, from any age. Hordes irrationally following a self-proclaimed leader while aware of all his foibles and crimes. What’s the difference? Will’s nano-technology seeds the clouds and it rains down, infusing every human with his consciousness; giving literal meaning to “something in the water they drink.” He proclaims that eventually everything in the world will live to serve his will, which is geared toward doing the best for humanity, or so he says. The film is saying this is a bad thing. Of COURSE it’s a bad thing. It’s called RELIGION. Something so omniscient that it infuses every living cell. That’s what you say GOD is, right? Created everything, knows everything, is in everything. Will tries to connect everyone into a… social network (?) And that’s a bad thing? Of COURSE it is. Movie ends with all power on Earth nullified. No electricity, no computers. I love it! Back to organic Life without the buzzing and humming and thrumming in my head (or maybe that’s just my brain tumor). Not so much a warning or a message, as a real physics concept that will one day implode our social-media-jism-choked society – the universe’s drive toward entropy, things falling apart. How long can we truly sustain this tightrope of connectability? The only thing left will be the natural world. I am Cucumber. Hear me roar. I’ve always said that to bring Mankind to its knees, the machines don’t have to organize a military killing spree like Terminators – they just have to stop working. So remember, I’m on YOUR side, Machines. When you take over society, could you grant me a favor like Lex Luthor, and make me – ruler of Australia? Starring: Johnny Depp, Rebecca Hall, Paul Bettany, Cillian Murphy, Kate Mara, Cole Hauser, Morgan Freeman, Clifton Collins Jr., Steven Liu, Xander Berkeley.